The aubergines and tomatoes in this dish almost melt together in the oven, forming a savoury, chunky semi-sauce for the nutty little chickpeas. Like many dishes of its kind (ratatouille, for one), this is best served warm or at room temperature, rather than piping hot or fridge cold. A bowlful of this, just as it is, makes a delicious lunch or light supper. Add rice or warm pitta breads and a green salad and you have quite a meal. Preheat the oven to 200°C/Gas 6. Cut the aubergines into 2cm cubes. 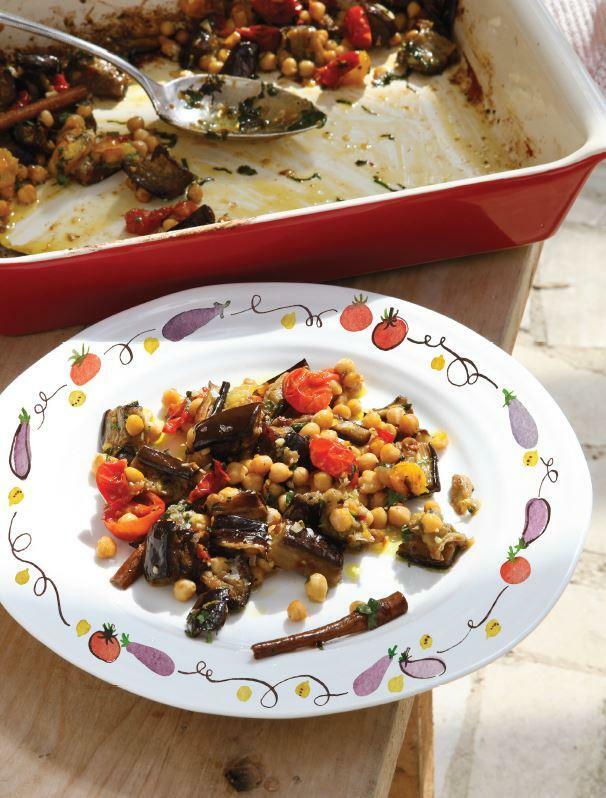 Heat the oil in a large oven dish or roasting tray in the oven for 5–10 minutes (this helps to prevent the aubergine absorbing too much oil during cooking). Carefully add the aubergines to the hot oil in the dish. Season well with salt and pepper, add the cinnamon, if using, and toss together. Roast in the oven for 30 minutes, stirring once halfway through cooking. Add the cherry tomatoes and chilli flakes to the dish. Roast for another 20 minutes, then add the drained chickpeas and garlic. Stir well and roast for a final 10 minutes. Remove from the oven and stir in the lemon zest. Leave to cool for about 15 minutes, then taste and adjust the seasoning. Serve warm, sprinkled with basil or mint, if you like.